If you don’t partake in much exercise, it would be very beneficial to do aerobic exercise from one to three months prior to skiing. This is steady paced exercise that takes your heart rate to a target level, and you maintain it there for a minimum of 30 minutes. To know what your personal target heart rate is, first find you maximum heart rate (MHR): 220 minus your age. Multiply your MHR by 70 percent to see which zone you fall in. This is the ideal number you should train regularly. Cardio fitness should be performed three to four times per week. This will help get your body used to regular exercise and is also a good way to shed a few excess pounds. 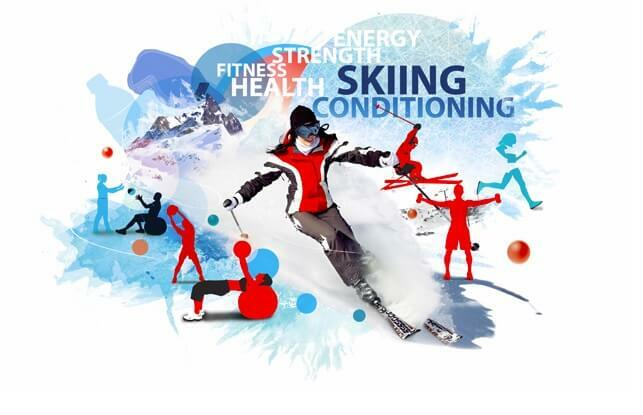 However, skiing is more anaerobic, meaning your heart rate is up to a higher level for short bursts, and therefore your bias for the three months prior to skiing should be on anaerobic training. This is most easily performed with interval training. For example, cycle classes or running fast for one minute, then walk for half a minute. Repeat these intervals for 20 to 60 minutes based on your fitness level. Make sure that you are well warmed-up before doing these, and if you have any health concerns seek medical advice first. If you have concerns about any of your joints, then try and stay away from running, and perform your intervals on the bike, elliptical or in the swimming pool. These intervals should fatigue your muscles so that they feel exhausted. Doing this style of training every other day is ideal, with cross-training techniques in between to allow your muscles to recover in between. Skiing demands power on many muscle groups, especially your quadriceps, calves and gluteus muscles. These muscles need to be able to generate large amounts of force in short bursts. Training should therefore be geared at fatiguing these muscles after four sets of 10 to 16 reps. Each large muscle should be performing 4 to 5 different movements (exercises) with 4 to 5 sets per movement to help gain quality strength and power for the upcoming ski season. Skiing requires some muscle groups to work steadily all day long to maintain your position on your skis or boards. This is particularly relevant to your calves to maintain ankle flexion, your adductors to stop your skis from sliding apart, and your transversus abdominis—the twisting motion of your abs–and multifidus (lower abdomen and lower back) to maintain your “core”. These core and calf movements such as calf raises and core twists should be performed with very high repetitions to help build the needed endurance for those days on the slopes. Skiing requires constant fine adjustments in order for you to adapt to the changing terrain, snow, speed and obstacles. Your joints and soft tissues will constantly provide your brain with information about your body position. Excellent balance means that you will be faster to respond to the conditions. Balance will improve with specific training. Performing exercises on Bosu balls, Swiss balls and balance boards with help to improve balance and confidence while skiing. Good flexibility will help you have a good stance on your skis and prevent injury. Be aware that interval and power training mentioned above will tighten your muscles if not counteracted by stretching. The most effective, and important time to stretch, is immediately after exercising when you are warm. Good flexibility in your calves is essential to having good ankle flexion in your boot. And, these muscles should be stretched with your heel down and knee bent. Flexibility has also been demonstrated to impact strength. You are at your strongest in the middle of a muscles available range, hence the more range you have, the easier it is to find this optimal range. Lastly, muscle injury occurs when a muscle is stretched beyond its normal length. Good flexibility is helpful to prevent muscle injury during a fall. Plyometrics is a form of training, which utilizes bounding and jumping to take a muscle from shortened to lengthened very rapidly. It is an excellent way to mimic the rapid dynamic demands of skiing while improving explosive power. An ideal way of performing plyometrics is while holding the basic ski pose perform box jumps, jump squats, jumping lunges, frog jumps and Bosu jump squats.